Some would say that the title of this post is purely metaphorical since penguins can't fly, [proof] and that we needed something eye-catching in this clickbait world of alternate facts. 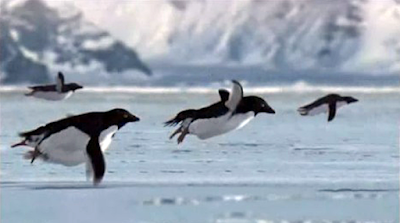 However there is a small group of Adélie penguins who have (re)gained the power of flight. When the extreme weather in the Antarctic becomes too harsh even for these hardy little birds, they take flight and head north to the southern tip of South America until the weather becomes livable again. Flying or lying, either way it is a great metaphor for our triumphant return to the world of satirical news. It has been almost a year since we last posted anything, and there were a number of reasons for our break, which may or may not be discussed in time with those who care enough to know them. There are differences between satirical news and what people are now calling fake news. Fake news is a deliberate attempt to mislead the public by presenting them with misinformation, with the aim of distorting a viewpoint or changing an opinion. Satirical news is a deliberate attempt to mislead the public by presenting them with misinformation, with the aim of making people laugh (usually only the smarter readers laugh because the dumb ones take it at face value. Also, it's not usually a laugh, more commonly it's a smile acknowledging the cleverness of the humor). The target audiences for each brand of news are polar opposites, satirical news is aimed at the smarter end of the spectrum; people who can see and appreciate the ingenuity of the story. Fake news is best delivered to the gullible and the people who are not tied to real facts. Either way, it is good to start your news story with some semblance of fact and then twist the story to suit your desired outcome by making the facts less and less factual. In extreme cases, such as in North Korea, fake news is state funded and is the only news that the public is allowed to see, allowing fascist dictators to maintain their evil grip on the people of their country. With no outside news or connection to any kind of social media, the people of North Korea have no way to fact check the stories they are fed, and many of them have grown up not knowing that other media sources exist. LTRN 8 news. The biggest and the best news. Could such a thing ever happen in America? What if the popular media was debunked and replaced by a single news source under the control of the government? 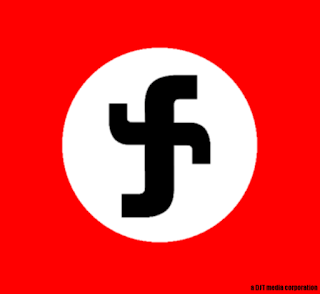 What if facebook was criminalized and a new dictatorial social media called fascbook was rolled out? Is it possible that a continual fact famine combined with political propaganda could brainwash the American public into believing anything and everything they are told, just like the North Koreans do? Don't stop checking the facts, don't believe everything you read on the internet, don't stop challenging everything you see or hear. Most of all don't let the fascists win, I have seen many "dystopian future" movies and I don't want to live there, unless it's the Death Race 2000 future, but it probably won't be since we are already living in 2017. As a footnote for those that care, this popular satirical news blog started out it's life in 2010 as "Altern8News" before being renamed as "My Twist News", and then "Slap The Penguin". The original redirect from www.altern8news.blogspot.com still exists for those who want to check our facts.